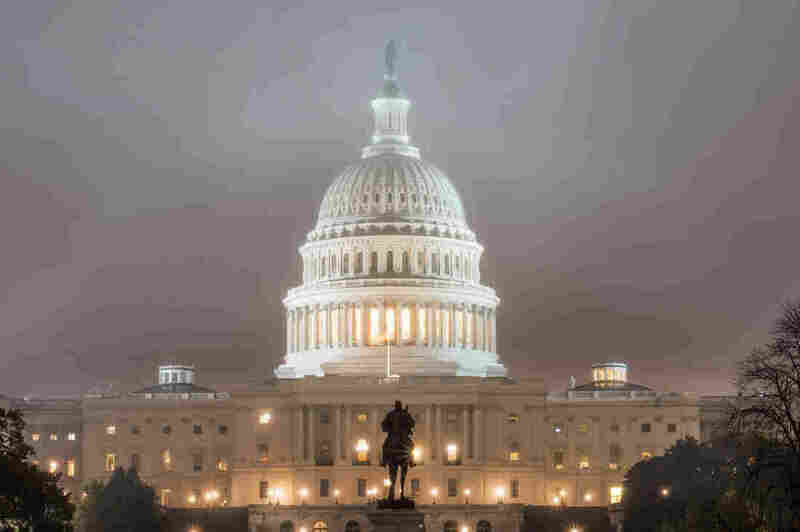 Congress Punts Shutdown Fight Deep Into December Republicans and Democrats on Capitol Hill are still fighting over President Trump's demand to include $5 billion for a border wall in the annual spending bill and have until Dec. 21 to get a deal. The lame-duck session of Congress will extend into late December now that bipartisan negotiators have passed a short-term extension of government funding. They have until Dec. 21 to finalize a spending deal. Congress voted to delay the threat of a partial government shutdown until Dec. 21 as lawmakers try to avoid political sniping in the midst of the public mourning for former President George H.W. Bush. The main sticking point in the spending negotiations is President Trump's demand for $5 billion for construction of a wall along the Southwest border between the United States and Mexico. Leaders from both parties agreed early in the week on a short-term spending bill that would extend funding for roughly a dozen federal agencies past the current Friday deadline. The bill also extends the Violence Against Women Act, which was set to expire on the same day. The House unanimously approved the extension and the Senate followed with a voice vote on it roughly an hour later, sending the measure to the president's desk for his signature. A two-week extension allows congressional leaders more time to negotiate, but the political dynamics that have so far prevented a deal are unchanged. Republicans want the bill to include $2.5 billion in immediate border security and wall funding with an additional $2.5 billion guaranteed to be allocated next year. Democrats are only willing to agree to $1.6 billion this year. Negotiators have made little progress on closing that divide. Many Republicans see this spending bill as the last chance to secure wall funding before Democrats take control of the House in January. But Democrats still wield significant power in spending negotiations, even as the minority party in both chambers. Leaders expect a significant bloc of House conservatives to oppose a final deal because they frequently insist the annual funding bills don't cut enough federal spending and they want even more money for the border wall. House Minority Leader Nancy Pelosi, D-Calif., called the wall "immoral, ineffective, expensive" on Thursday and said that while the president promised it "he also promised Mexico would pay for it." She said she was not willing to accept any money for wall construction in return for some resolution to allow those young immigrants brought illegally to the U.S. as children to remain in the country. They currently face possible deportation as part of the administration's move to end the Deferred Action for Childhood Arrivals program. Instead, Pelosi argued, because of the short timeline, Congress should simply pass a one-year extension of current funding levels for the Department of Homeland Security. Republicans control 51 seats in the Senate, and most legislation needs 60 votes to be approved. That gives Democrats considerable leverage over spending bills. That reality has been a frustration for Trump in the past and he has been inconsistent on whether he wants to avoid a partial shutdown. Senate Minority Leader Chuck Schumer, D-N.Y., says bipartisan solutions exist in Congress if Trump will accept them. Schumer also insists the additional money is unnecessary because Trump has not spent the $1.3 billion that was already approved by Congress for limited construction of barriers along the border. "The president is the only person who holds the ultimate responsibility for a government shutdown," Schumer said on the Senate floor. "He certainly has the power to shut down the government, but he has two very reasonable ways to avoid one." Trump remained largely silent on the wall issue throughout the week of remembrances and funeral services for Bush. While the president has not publicly discussed the spending bill in several days, Senate Majority Leader Mitch McConnell, R-Ky., is predicting a solution may be near. McConnell said at the annual Wall Street Journal CEO Council that a shutdown is not likely but Trump still needs to work out the details with Pelosi and Schumer. "Even though this is a Republican government, the Democrats are not irrelevant," McConnell said. "Those discussions will have to come to a conclusion." Schumer and Pelosi are scheduled to meet with the president next week.